On Thursday 26th June a group of GU coaches went along to Fullbrook School in West Byfleet to assist in the running of the school’s first ever Ultimate tournament! Nine teams from three schools attended (Fullbrook, Rydens and Salesians) and after some great play and several close matches, Fullbrook were crowned the champions. The session started with some basic throwing and catching skills with demonstrations and tips from the GU players. 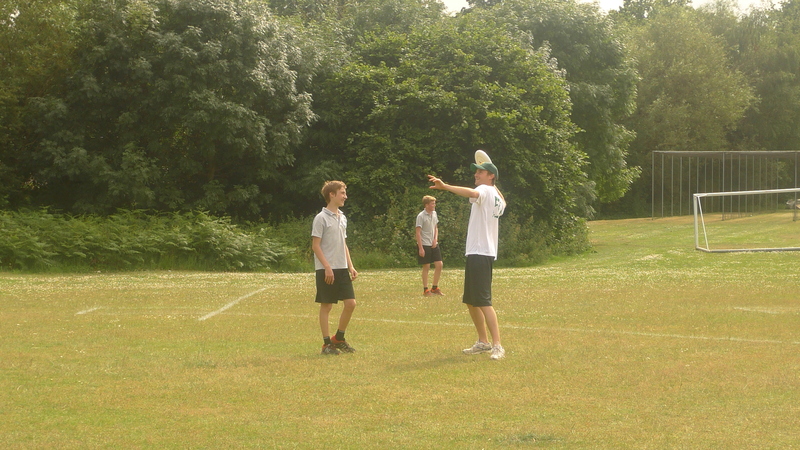 Followed by the 5-aside tournament, with a GU captain on each team to help with tactics. The presentation at the end saw brand new discs being awarded to the winning team and two tournament MVPs. If you’d like to help with future junior coaching, or you know a school who would be interested in running a similar event, get in touch! There will be no training on Saturday 21st or Monday 23rd June. This weekend, most of the club are away at Open/Womens Tour 2 in Nottingham. Our Thursday night pick up session, plus both trainings will continue as usual after Monday. New Training Location + Summer Pick up! GU will be continuing to train twice a week all through the summer. Saturdays will be at Shalford Park, Guildford and Mondays will be at Queens Avenue, Aldershot. We are also starting a pick up session in Guildford on Thursday nights! Casual games at the University of Surrey PATS Field, 6.30pm-8pm (or until people leave/go to the pub quiz). Everyone welcome, no charge. Bring a light and dark top, boots, and water. If you’re coming, it would help if you could like the post on the FB group so we have an idea of numbers. Pick up will run until it starts getting too dark/cold in September.